Children's choirs, Latin American Baroque music; youth orchestras; the Bolivian Amazon region; classical music instruments. This combination of elements seems surreal, but is truly possible. 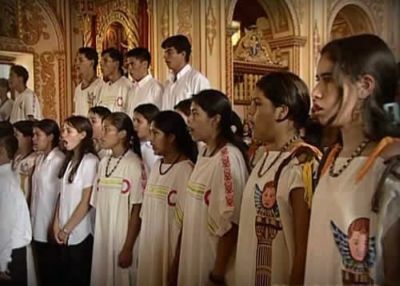 Starting in the 1970s, thousands of scores with Latin American Baroque music have been found in the former compounds of Jesuit missionaries in north-western province of Santa Cruz, Bolivia. In the wake of these 're-discoveries' and after being studied for many years by individuals including the Argentinean conductor Gabriel Garrido and the Polish priest and musicologist Pjotr Nawrat, a Baroque music festival was organised in 1996. This festival became a bi-annual event in the region. Young musicians from the Indian communities were involved. It is not uncommon to encounter boys and girls practicing their string or wind instruments under the washing hung to dry in the countryside. With a bit of luck, one can watch an entire children's choir practicing on a village square. "Thanks to the work being done by the children's choir and youth orchestra in Urubichá - an Indian village some 340 kilometres from Santa Cruz de la Sierra, many communities in the region became interested. At least ten choirs and orchestras have been formed for children and young musicians aged 8 to 24. As a result, the SICOR - Sistema de Coros y Orquestas - was established as a coordinating umbrella organisation in 1998", says Rubén Darío, SICOR's director. "Of course our organisation primarily helps to improve the quality of music education in the region. But we are also devoted to improving the future prospects on the job market for these young musicians. We established a system of grants for schools ad universities that they can utilise by doing volunteer work. The music education also stimulates the musicians to develop their creativity and to work in groups. In turn, this stimulates the community structure that is characteristic of the Indian villages in this region." "For the record, the choirs and orchestras do not limit themselves to Bolivian Baroque music. They also perform interpretations of local and national folklore and pieces by classical European composers, including Händel, Mozart and Vivaldi, which they perform at national and international festivals," says Darío. SICOR receives funding from the Strømme Foundation.